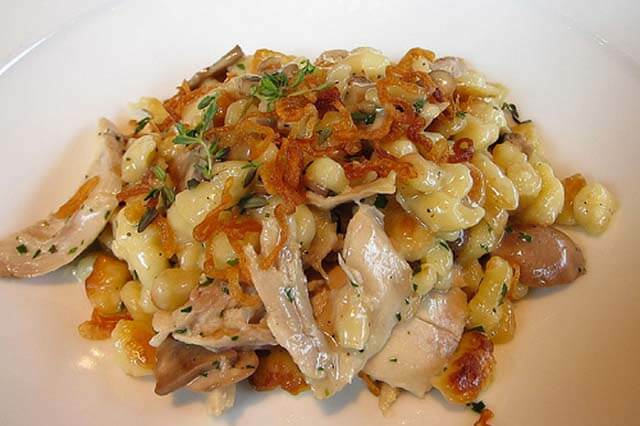 Make spaetzle as normal. Put aside. In a saucepan, fry finely diced onion in 2 tblspn olive oil. Add chicken. Fry lightly. Add mushrooms, capsicum, stock cubes, salt & pepper. Cook for 10 minutes with lid on. Remove lid, add cream. Blend cornflour with a little water then add cornflour and thicken. Add parmesan cheese. Mix in steamed broccoli and cooked spaetzle. Add chopped parsley. Pour into large baking dish. Sprinkle with a little extra cheese and paprika. Brown in oven for 10 mins. Serve with side salad. Can be made the day before and heated on the night.